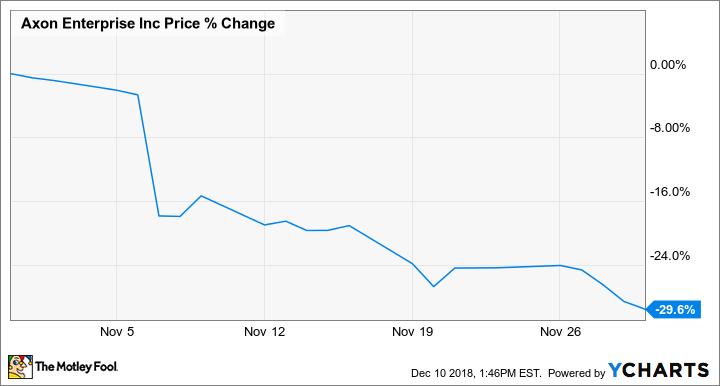 Shares of Axon Enterprise (NASDAQ:AAXN) took a spill last month after the maker of Taser electrical weapons posted underwhelming results in its third-quarter earnings report on Nov. 7. Though the company actually beat analyst estimates, growth slowed, which seem to weigh on the stock after shares had more than doubled year to date prior to the report. The sell-off was puzzling given the seemingly strong round of results. Axon said overall revenue increased 16% to $104.8 million, beating estimates of $103 million. Growth in its cloud division (led by Evidence.com) was particularly strong, rising 47% to $23.9 million. An officer with an Axon body camera. Image source: Axon. However, revenue from its Taser weapons division, which still makes up a majority of the company's revenue, increased just 7% -- as the company begins to roll out its new TASER 7, meaning prospective buyers likely waited to buy the new version. That should help drive accelerated revenue growth of the electrical weapon in the coming quarters. Axon also continued to show margin improvement; gross margin jumped from 55.1% to 62.6%, due to improvements in Axon's body-camera mix and lapping discounts a year ago for early adopters of its Axon Fleet dashboard cameras. That helped drive adjusted earnings per share up from $0.05 to $0.20. Despite those solid results, growth was noticeably slower than it was in the second quarter, when revenue jumped 25%; the company left its guidance untouched, indicating that growth may continue to moderate. For the full year, management said it expected revenue growth at the midpoint of its previously guided range of 18% to 20%, and it maintained adjusted EBITDA (earnings before interest, taxes, depreciation, and amortization) margin guidance at 14% to 16%, in line with the 14.8% it reported in the third quarter. Axon shares continued to decline after the earnings report, falling below $45 per share, a sign that shares may have been overbought earlier in the year when they reached $75. After all, Axon is a high-priced growth stock, and such stocks need to consistently impress investors in order to keep growing. Still, with the release of the TASER 7 and Axon's growing cloud segment, there are a number of positive catalysts favoring the company ahead. That could make the recent sell-off an excellent opportunity for long-term investors.